A while back I wrote a post on the prolific San Francisco druggist Geo. S. Dickey. 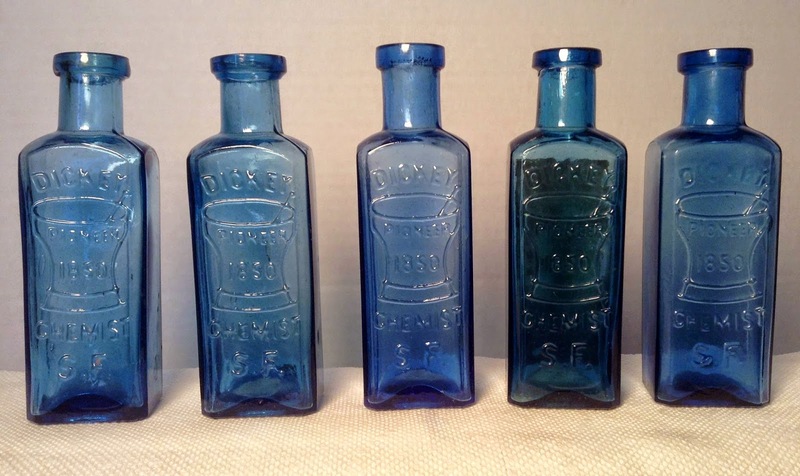 Even though I tried to gather all the information that I could on Dickey and his forty plus years of manufacturing one of our favorite western distributed bottles, by the replies from diggers and collectors to the post, I feel the post was not comprehensive. Geo. 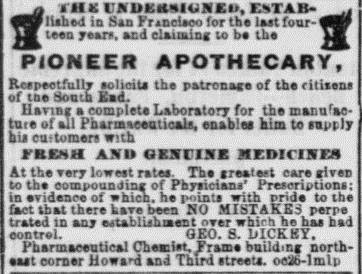 S. Dickey started, according to his advertisements, his apothecary business in San Francisco early in 1850. The following advertisement placed by Dickey in October of 1864 claims he started his business fourteen years earlier in 1850. This is the earliest ad I could find for Dickey while he was operating at Howard and Third Street in a frame building. According to what information I could gather The first bottle produced by Dickey was the example pictured below. Flat base of the first embossed Dickey bottle. 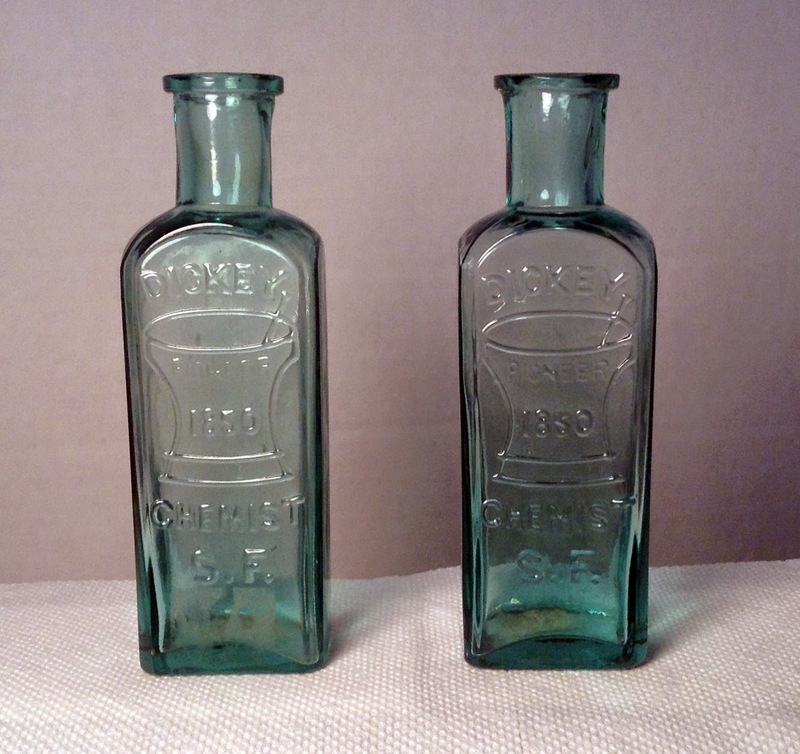 The above pictured bottles are believed to be the second variant of the Dickey bottle. They come in shades of blue, have a tooled top and a square indented base. I have no idea about the timeline of when this bottle was blown but shared knowledge points to this variant as being the second of the Dickey bottles. This variant has larger and (kind of) flat embossing and the S.F. is higher on the base of the bottle then the last variant. The bases of the amber Dickey bottle with applied tops. Note the circle base with the dot in the center. 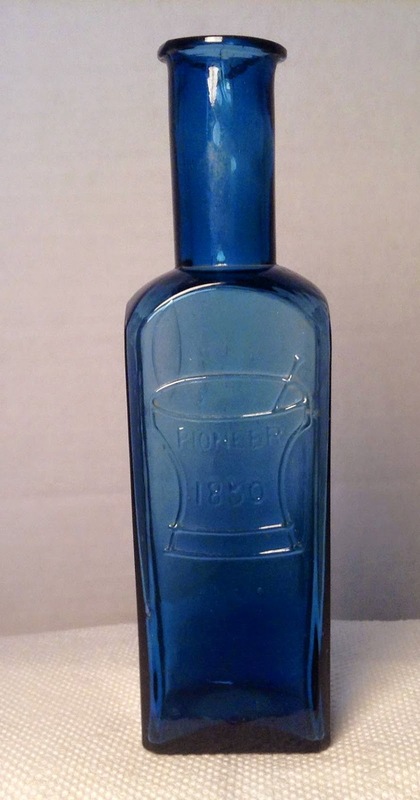 This is the same variant as the blue applied top bottle with the circle and dot on base. Just in amber coloration. 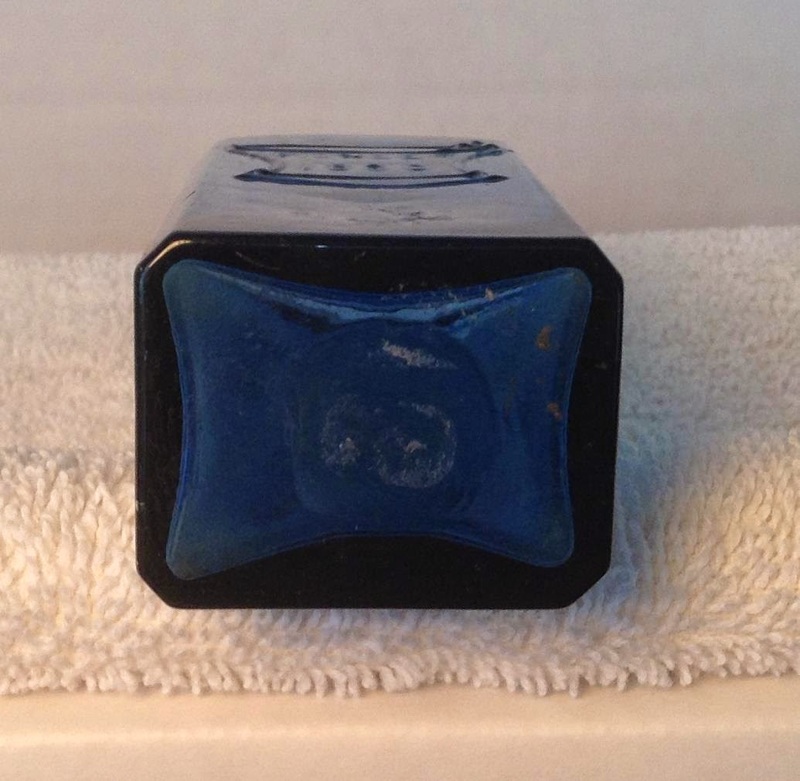 The bases of the blue Dickey with a applied top. Circle and dot on base. 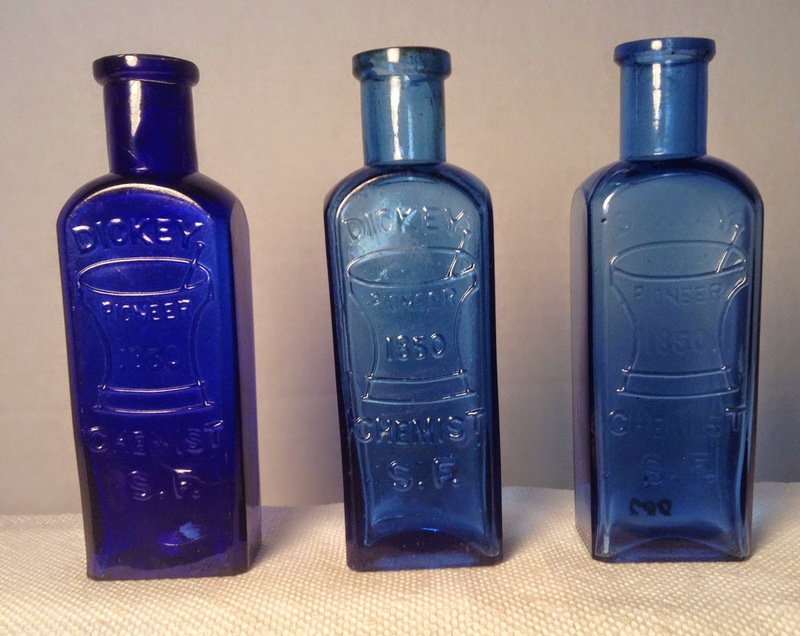 Four examples of the last variant of the Dickey bottle with the pestle on the left. Very informative, Rick! Just scored two with labels today from a good friend, one in the original box. The earlier example states on the label that it is for the complexion and teeth (as does the early advertisements). The later one with the label and box is tooled and has the California Food and Drug Act date of 1907 on it (I wonder how late they were made?) The box and label no longer mentions its use for the teeth...probably due to the Food and Drug act restrictions? Another interesting aspect found on the later boxed bottle is the following: "Originated by Geo. S. Dickey" -- "Manufactured by E.B. Harrington & Co Los Angeles, Cal". It's probably already been documented...so does anyone know when the Los Angeles establishment of Harrington & Co took over the Dickey Company? They are a fun bottle to collect, but the rarer variants and colors are truly tough to come by. Still looking for an aqua and blue stovepipe and any other odd colors...I know, so is everyone else!